Rating: 4.6/10. From 57 votes. Summary: The description, specs, pricing and photo for the Rexio Comanche II-A revolver. The Comanche II-A is a six shot revolver produced by Rexio in Argentina and imported into the United States by Eagle Imports. (Note: Rexio markets its revolvers under the Pucara and Jaguar names. The Comanche is the U.S./Eagle Imports version/name for these pistols.) 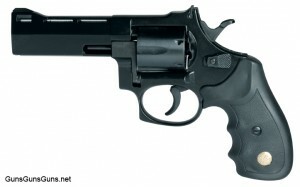 It’s built on an aluminum alloy frame and chambered in .38 Special. Note: This pistol is not rated for +P ammunition. .38 Special 6 3″ 8″ n/a n/a 33 oz. .38 Special 6 4″ 8.5″ n/a n/a 35 oz. This entry was posted in .38 Special, $25-$250, Eagle Imports, Full size, Revolver, Rexio on July 17, 2010 by Staff.